The following is a letter sent from an underground group of workers in Fiat Poland in Tychy. It was written on June 13, on the eve of a referendum in Pomigliano d’Arco near Naples. The workers there are being asked to decide about their work conditions. Fiat agreed to invest money in this plant for production of the Panda, which is currently produced in Tychy, Poland. But the bosses would like people to agree to work on Saturday, to increase the number of daily shifts from 2 to 3 and cut down on breaks. 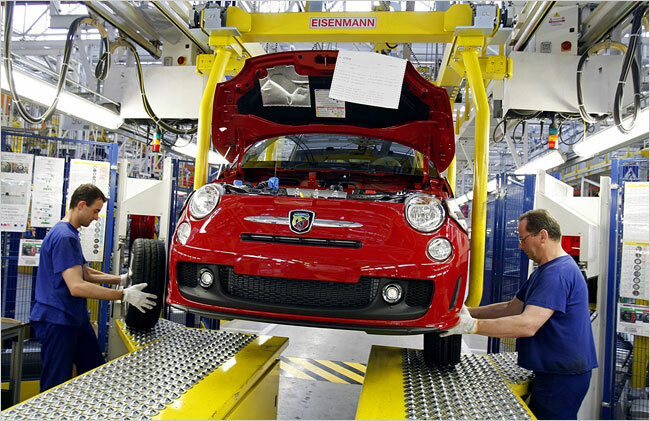 Three of the four trade unions in Fiat's Pomigliano d'Arco plant have agreed to these conditions. Those three unions have agreed to let their members vote in a referendum which will ask whether the veto of the fourth trade union should be rejected or not. Fiat is playing games with the workers. First, it moves production to Poland and tells its employees that they must work hard, be flexible and exceed all production norms to keep their jobs. All is done very well in Tychy - there can be no complaint of the management (... except when unions ask for raises or bonuses for their very productive workers or question work on the weekend.) Tychy plant is Fiat's biggest and most efficient in Europe. At the end of last year, we began to hear rumors that now Fiat wants to move jobs to Italy again and since that time there is some fear in Tychy plant. Fiat Polska thinks now it can do as it likes with us. They gave bonuses only 40% of last year, despite the fact that we broke all records in production. They think people won't fight because they are afraid they will be the ones to lose jobs. But we are angry. Third "Day of Protest' of workers in Tychy scheduled for June 17 will not be as polite as the last. What do we have to lose now? Workers in Italy are being asked to accept worse conditions. All the time, Fiat shows workers that if they don't agree, they will lose jobs. If they don't work like slaves, somebody else will. We know that the hard work of our Italian colleagues is taken for granted by Fiat, just like our work was. We hoped that Fiat unions in Italy would fight. Not so we may keep our jobs in Tychy, but to show resistance to such work conditions. Our unions, our workers, have been weak. We felt we were not in a position to fight, that we were poor, begging Fiat for any job. We let down Italian workers, whose jobs we got. Now the same is happening to us. It is clear that this is a no-win situation for any worker. We cannot go on like this any longer, competing against each other for jobs. We need to unite and fight for our interests internationally. For us, there is nothing left to do in Tychy but go down fighting instead of on our knees. We will encourage our colleagues to acts of resistance and sabotage against the company which sucked us dry for years and now spits us out. Workers, it is time for change! Thanks! Everybody is happy the word got out in Italy. The mainstream Polish press (Gazeta Wyborcza, Wprost magazine, Puls Biznesu, etc. etc.) started to publish news about the letter after it appeared in Liberazione and Il Manifesto. Sensationalists headlines read "Workers from Tychy appeal for the sabotage of Fiat" and the story has now been reprinted on hundreds of web portals and in various newspapers. This is being discussed on various workers forums now - not only in the automotive industry. I haven't had time to follow exactly due to an urgent action we had to do here ... but it looks interesting. And, as can be expected, a small witch hunt is going on in Tychy.